The company "Luxury Antonovich Design" offers a full range of services in the field of construction, interior design, the design of offices, restaurants, hotels. Applying to our company, you will receive an author's design project. Each of our plans is developed individually without typical schemes and solutions. Working with us, you will have a future image of the interior in a photo-realistic image and technical documentation that will be required during construction or repair work. We have assembled a team of specialists of the highest category who will be able to turn into reality the architectural solutions of any complexity, manage the entire project professionally, from the development and agreement of technical documentation to the object commissioning. The whole engineering and professional staff of the company have extensive experience, and high qualification in the field of engineering and construction and installation works, thanks to which our construction company provides a guarantee of quality performance of the tasks. The main potential of the construction company "Luxury Antonovich Design" is concentrated in people — these are our employees, partners, and customers. Permanent professional growth and development of the company are achieved through the use of modern technologies, the introduction of new construction products. Our goal is to be the market leader. We increase the number of our projects and develop new ones. We have everything to achieve this goal: emerging markets, modern technologies, and highly motivated employees. Interior fit-out and decoration is a large complex of repair and construction works, without which the whole interior design cannot be completed. Fit-out service in Dubai is a creative process that is why the result of all renovation and construction manipulations largely depends on the success of the interior design project. Luxury Antonovich Design staff includes more than 150 labour — among them 10 lead engineers, painters, plasterers, mosaic tile layers, electricians, plumbers, plasterboard installers and many other narrow specialists with many years of experience. Each of them is a true professional in his craft and makes his internal fit-out work flawlessly. Masonry, painting (art/texture), dry wall/gypsum detailing, mosaic works, intricate marble works, etc. Full engineering works with a specialty in chilled water systems. In-house electrical engineers and DEWA certified installation team. Total carpentry solutions, reproduction of antique or branded furniture and hand carved furniture. Construction teams for pools, fountains and dedicated garden maintenance services. Master craftsmen available to create customized stained glass designs for your home or office. HOW TO CREATE COMFORTABLE ATMOSPHERE WITH THE HELP OF INTERIOR FIT-OUT COMPANY? home and commercial elevator installation. Installation and replacement of plumbing (Replacing the riser, installation of water supply, installation of water filters, sinks, toilets, and other plumbing equipment). Plasterboard works (Installation of walls, ceilings and plasterboard partitions, with which you can make an exciting re-planning of your office space). Floor coverings (We provide first-class floor solutions. Our professionals install underfloor heating; install tiles made of marble and other stones, laminate, parquet, etc.). Plaster works (All curved walls are leveled, cracks are removed, and plastering works of any complexity are carried out. We work with any finishing materials, liquid wallpaper, Venetian plaster or other decorative plaster). We help our customer to choose the right office design and interior fit-out that will fit the company. We make a complete estimate for the repair and fit out works of the office, pay attention to the quality of building materials and guarantee the professionalism of our team. The most qualified and competent experts of Luxury Antonovich Design can provide you with fit-out works of any kind building up to the smallest detail. From the plastering, decorative plaster insulation, and sanitary ware, parquet or other type of flooring, gypsum works and wallpapering and painting, up to the great fit-out works that only most talented designers and decorators will work on: decorative wall panels — 3D wall panels, exquisite carved wooden ceiling and walls, stained-glass, plastic and gypsum arts, interior wall painting and murals. all kinds of fit-out work. Luxury Antonovich Design — top fit-out company that can deliver a wide range of interior design and fit-out solutions can offer original creative design and architectural ideas and approaches for the development of the design project of your house, apartment, office or any industrial giant with a full range of services for its implementation. We deliver beautiful interior and exterior fit-out projects for the best luxury brands, combining chic and exquisite style and stunning filling. Our team works in a wide variety of sectors, like high-end residential (villas, country houses), offices, boutique hotels, and restaurants, as well as clinics, sports stadiums, and airports. Luxury Antonovich Design employs only professional, qualified, polite, punctual and executive repair technicians. We work without intermediaries, which improves the process of creating the necessary result in the shortest possible time. We make estimates as accurately as possible; advising the client at all stages of repair and fit-out works. We purchase the highest quality building materials from proven European and global suppliers. We adhere to all technical standards; comply with the deadlines previously agreed with the client. We provide an individual approach to each client. Our team performs assigned tasks regardless of the season, coordinating the schedule with the house owner, taking into account his wishes and recommendations. Luxury Antonovich Design Company provides services for the selection, purchase, and delivery of furniture. We cooperate with furniture manufacturers all over the world who can make high-quality furniture on an individual project. The foremost vital reason to work with us is that we select absolutely everything for the future interior: materials, furniture, doors, lamps, plumbing fixtures, curtains, and decor. A professionally qualified architect develops the furniture layout plan. You receive two-three quality options and can choose the one you like. Furniture selection and delivery from Luxury Antonovich Design will allow you to save time and get the maximum result in the interior. Ordering furniture from Luxury Antonovich Design, you get the best furniture pieces from the world's best furniture brands. The main potential of the construction company "Luxury Antonovich Design" is concentrated in people — these are our employees, partners, and customers. Permanent professional growth and development of the company are achieved through the use of modern technologies, the introduction of new construction products. Our goal is to be the market leader. We increase the number of our projects and develop new ones. We have everything to achieve this goal: developing markets, modern technologies, and highly motivated employees. Perfect taste combined with the use of the latest trends of the industry is the signature handwriting of the interior design company "Luxury Antonovich Design". Timeless architecture and sophisticated design, performance on the contrast of styles, color solutions and expressive textures always lead to maximum functionality of the object, as well as to its aesthetic completion. Designers of the company create modern interiors, working in several stylistic directions: modern, art deco, classics. The main feature in the design is attention to the smallest details. The rare materials are used in work — valuable tree species, metal, natural stone, leather, glass, exclusive fabrics. Our specialization is interior design and construction and finishing works. Our work is the mobilization of fantasies, ideas and skill and the embodiment of your square meters into reality. We take care of that coziness, comfort, and functionality will be the three sacred rules of your house. It is fitting out of interiors — a service for the integrated purchase and production of all interior elements — furniture, decor, decoration materials, painting, vertical landscaping systems. 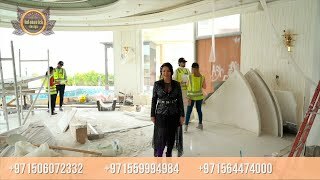 You can buy wallpapers, decorative plaster, tiles, stucco decorations, frescoes, floor coverings, lighting systems, electrical fittings, sound-proof and acoustic materials in the interior design company "Luxury Antonovich Design". Our experienced specialists will help you to choose the required collection. The product range is constantly updated, what allows us to offer only the best samples from world famous manufacturers. Representatives of our company will help to decorate any space properly, based on individual wishes.